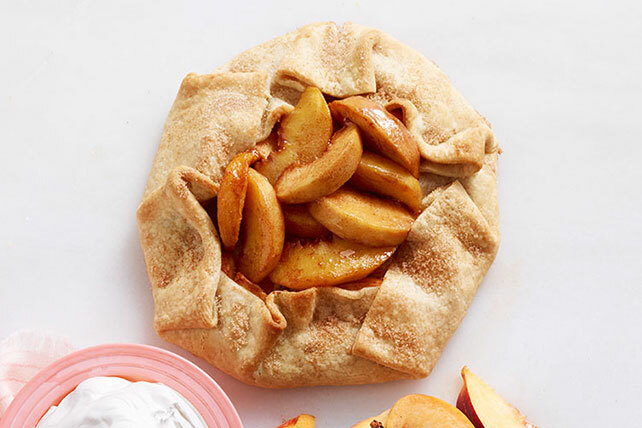 See how cinnamon, cream cheese and fresh peaches bake up into a bubbly Freestyle Peach Tart masterpiece. This delectable peach tart is ready in 40 minutes! Unroll pie crust on foil-covered baking sheet sprayed with cooking spray. Combine sugar and cinnamon; mix 1 Tbsp. with cream cheese. Spread onto crust to within 2 inches of edge. Reserve 1 Tbsp. of the remaining sugar mixture. Toss peaches with remaining sugar mixture; spoon over cream cheese mixture. Fold edge of crust over peaches, leaving center uncovered; sprinkle with reserved sugar mixture. Bake 25 min. or until crust is golden brown and fruit juices are bubbly. Cool slightly before removing tart from baking sheet. Serve topped with COOL WHIP. Stir additional 1/2 tsp. cinnamon sugar into COOL WHIP before spooning over tart.